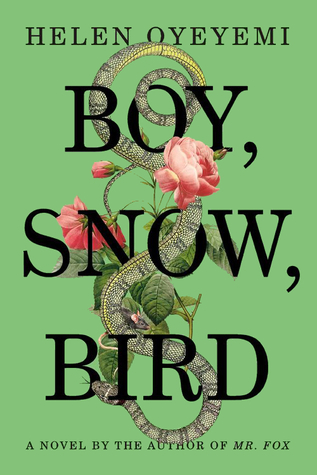 I’m having trouble putting my feelings about Boy, Snow, Bird into words. I liked it and found it tough to put down once it got going—both Boy’s and Bird’s sections of narration are fascinating, and Oyeyemi’s prose is incredibly evocative. The little hints of fantasy, particularly the focus on mirrors and Bird’s mimicking skills, added a nice element of intrigue. Bird’s dark skin has the unfortunate power of reminding the Whitmans of the painful past they’ve tried so hard to forget, and Boy hates their obvious bias toward porcelain-skinned Snow. It’s this bias, as well as the nagging feeling that Snow is not as innocuous as she looks, that leads Boy down the “wicked stepmother” path she never thought she would follow. Even though you know it’s coming because of the blurb, it’s hard not to root for Boy’s rational side to win out against the sudden and irrational hatred she feels for Snow after Bird’s birth. On the other hand, I also felt like it ended too abruptly and didn’t adequately explore the bombshell that gets dropped right at the end—though to be honest, I was surprised at how unsurprised I was when the big reveal is made. I think I was also expecting a bit more commentary on the state of race relations in mid-twentieth century Massachusetts, but other than some token mentions of the “colored school” and things like that, the focus was mainly on the state of race relations within the Whitman family, which, of course, was fascinating. I feel like Boy, Snow, Bird throws a lot of things at you at once: it has the slightly misty feel of a fairy tale, but its gritty realism also rings true; the characters’ identities are simultaneously fluid (as they work to define themselves) and rigid (as they work to discard the roles others attempt to assign to them); the book ends, and yet I didn’t feel the story was quite over. It was really a lovely book, and I’m glad I read it, but I’m especially glad that I’ll be discussing it with friends later today because maybe they’ll be able to show me what I’m missing.